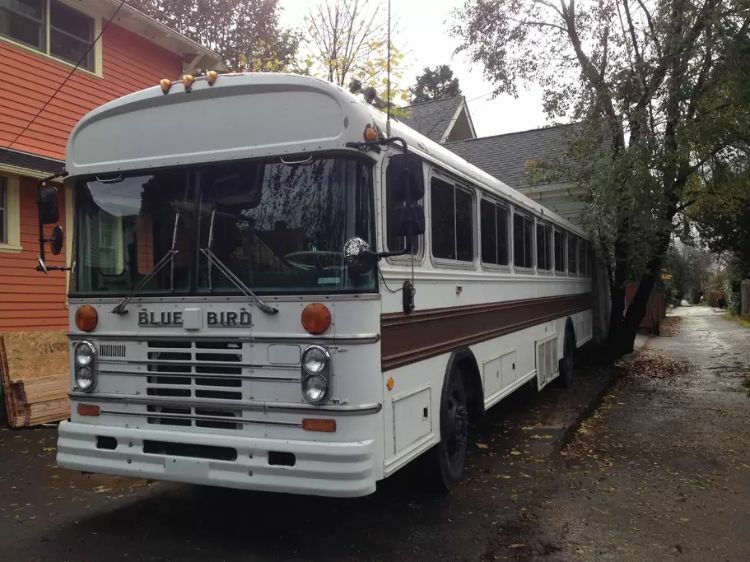 An adorable 1984 Bluebird bus that has been converted into a cozy vacation cabin. 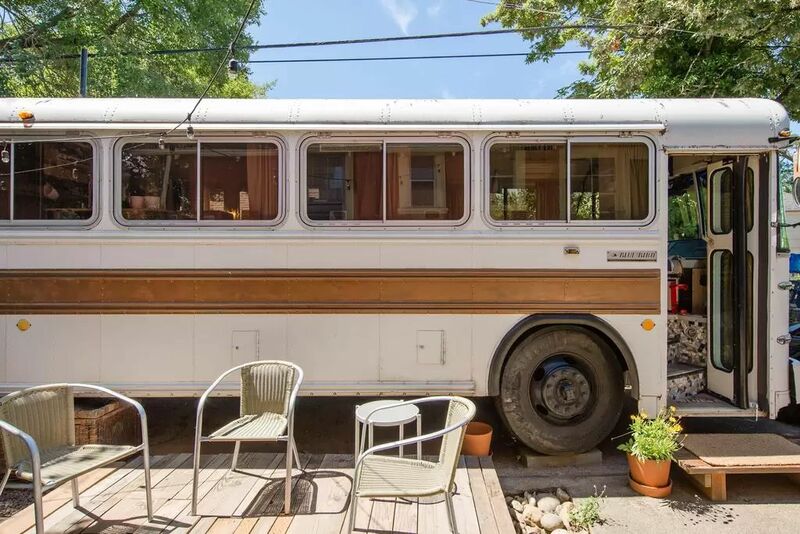 "Lady Bluebird" may be small on space, but it offers charming weekend accommodations for anyone who has ever been curious about life on a converted bus. 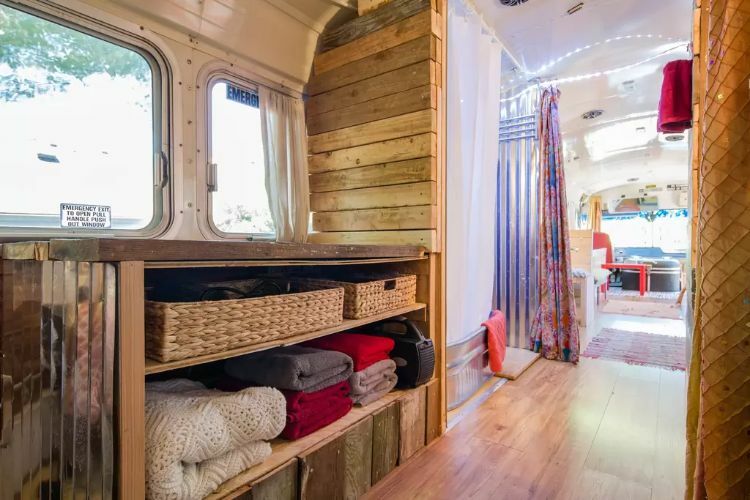 Reading owner Amy Suleski's Airbnb description of the bus makes you instantly interested to step aboard and see this fully equipped, fun, and funky converted bus. 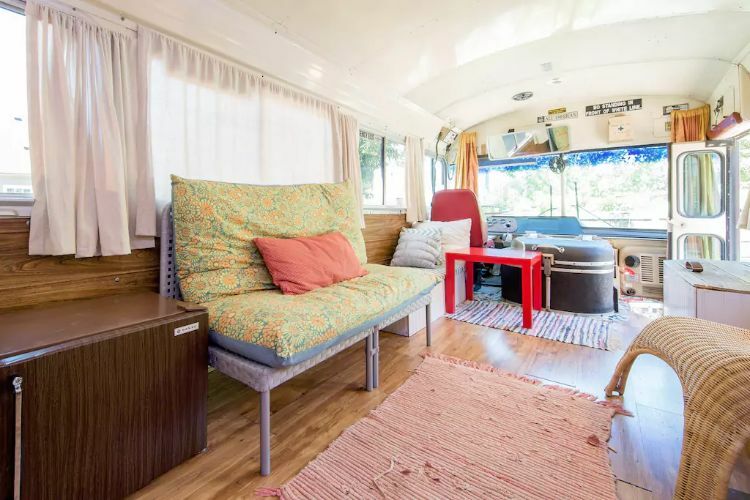 As you step onto the bus for the first time, you'll immediately notice the bright, comfortable living area, and as you look towards the back of the bus, you'll realize that 320 square feet actually seems pretty spacious! 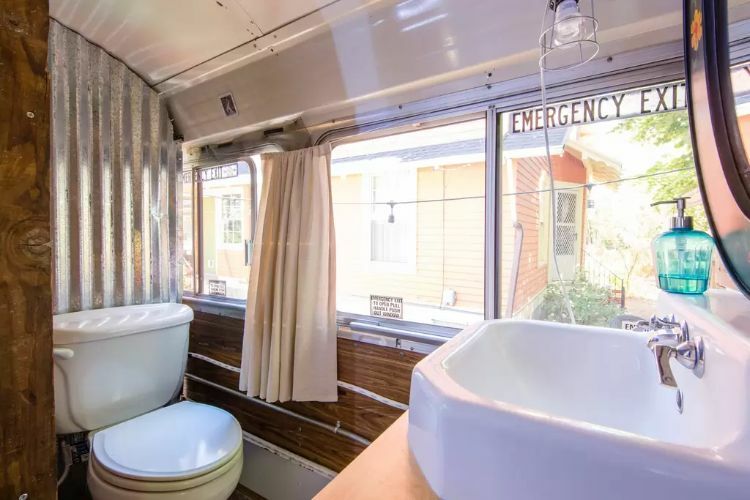 And yes, the bus is still drivable, creating a cool, quirky RV! An overstuffed, colorful couch and a pillow-covered wicker chair offer sitting space for relaxing and unwinding. Hardwood floors and white curtains create a fresh, clean space that is inviting and peaceful. A media center and a big screen TV offer a more traditional living room environment and essential entertainment, while end tables offer storage spots. 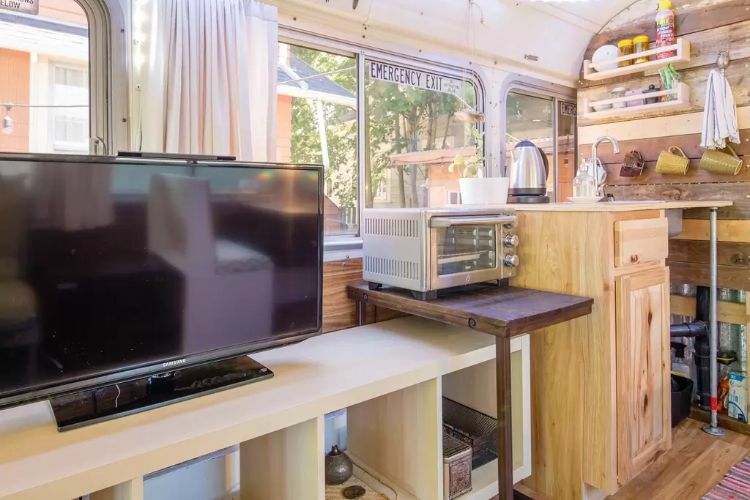 The kitchenette is located next to the sitting area, and offers a dorm-sized refrigerator, microwave, and sink for fixing or heating up quick meals. Across from the kitchen, there's a cool, built-in booth that can accommodate up to four hungry diners. 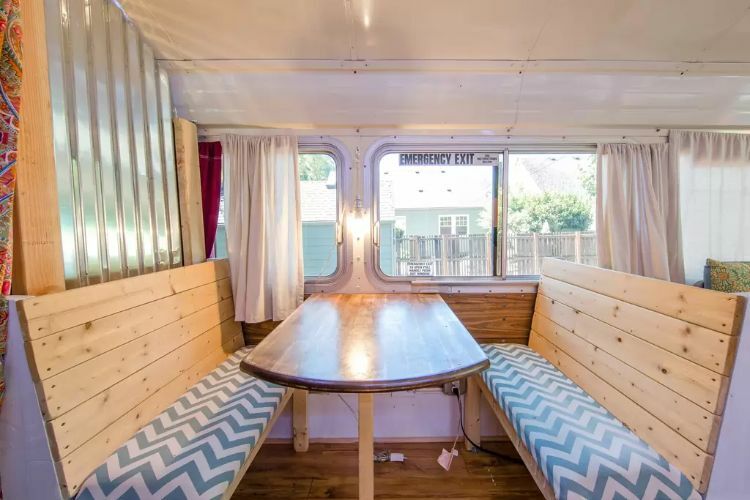 Comfortable cushions add color and softness to the wooden benches, and the nearby window provides plenty of natural light while you nosh. The most memorable part of the bathroom is probably the oversized, vintage-inspired galvanized steel bathtub. 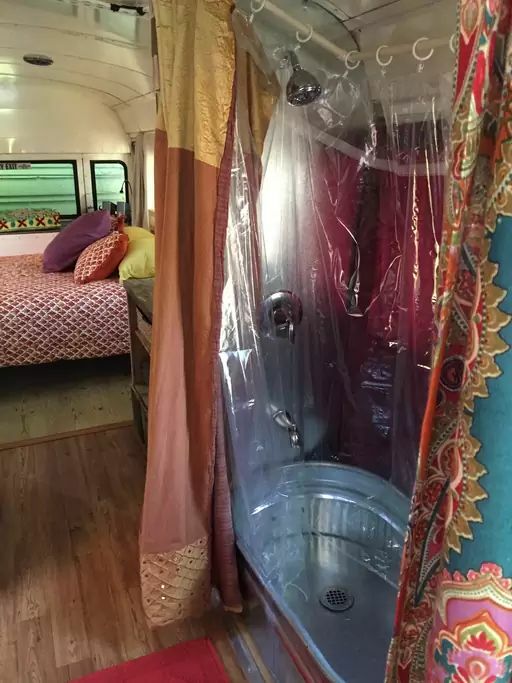 It adds a retro touch and creates a cute kitsch factor inside the bus. Storage shelves and cubbies next to the bathroom hold available towels and blankets. 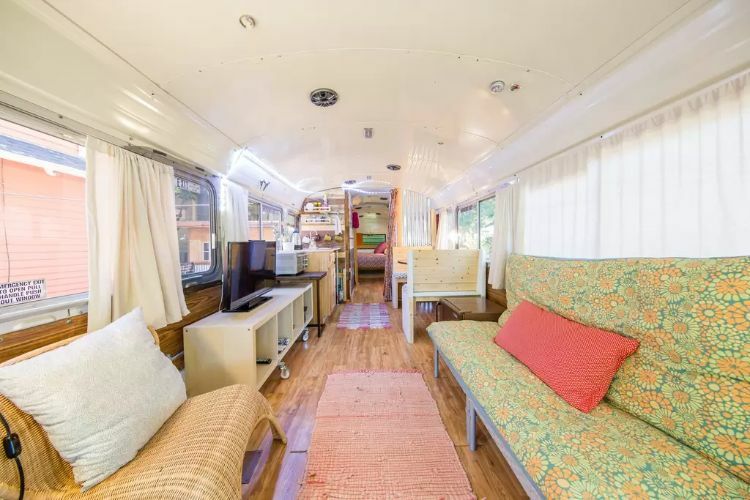 The bus offers heat, air, and electricity, and there's a table and chairs outside the bus for nighttime relaxation or meals. Prepare outdoor dinner using the provided barbecue pit or take a load off during the cooler months sitting in front of the fire pit. 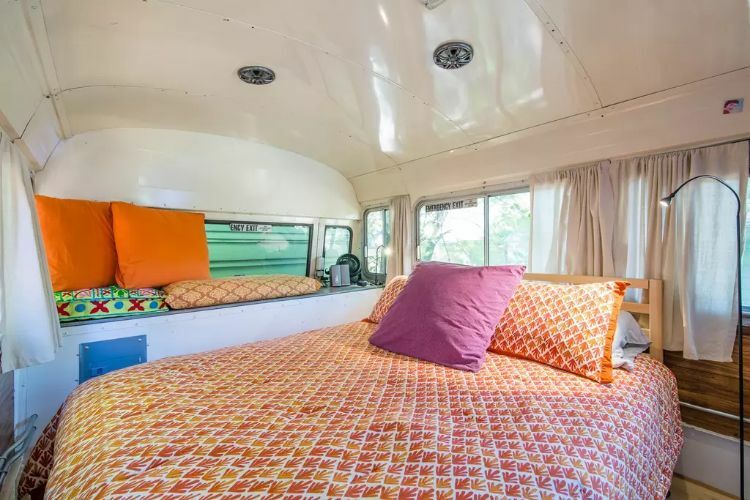 This adorable bus is the perfect place to enjoy a fun weekend in Portland and stay in a unique, quiet, and cool location minutes away from the sights and sounds of the city.